Two side dishes packed with flavour and massive health points! I had this recently for a light-yet-filling lunch with toast and hummus. Steam the cauliflower and broccoli together for 5 to 10 minutes, until tender but still still crisp. Run under cold water to stop cooking, and drain. 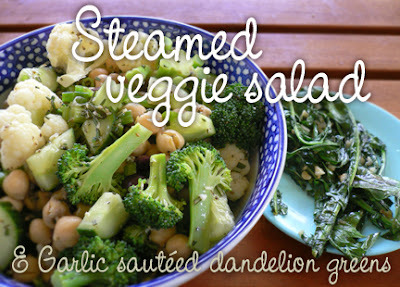 Place in a large bowl with the chickpeas, cucumber, green onions, olives/artichoke hearts and herbs. In a cup, mix together the garlic, oil, lemon juice and spices. Stir into the salad. Serves 4. In a skillet, heat the oil and add the garlic. When it starts to fry a bit, add the dandelion greens and toss around until wilted and a bit crisp on the edges, around 4 minutes. Sprinkle with lemon juice, season with salt and pepper and toss again. Serves 1 as a side dish. *NOTE: If you like, you can chop the dandelion greens first and add a few pine nuts while sauteing. Makes an exciting topping to toast with hummus!